Click names to highlight apple pictures. An early maturing, dark red apple with excellent fruit quality and field immunity to diseases, (this variety requires less spraying). It is spicy and great for either baking or eating. August 15. 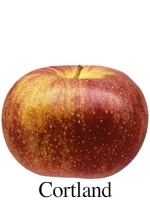 An early ripening apple with a delightful balance of flavors; it is semi-sweet, crisp, juicy and makes a fantastic eating apple. August 20. Its thin skin and smaller size make it a perfect lunchbox apple. It has a mild, sweet flavor with a creamy yellow flesh. September 8. This versatile apple is great for eating, pies, sauces, and salads. It's juicy, somewhat tart, and has an aromatic scent that lets you know fall is here. September 15. This is a great keeping apple with a spice all its own. It has a crisp, juicy, flesh and is good for eating, but a perfect pie apple. I think Empire is the best apple on the market. A perfect apple for baking or eating. It is a cross between a Delicious and McIntosh, and is a blend of sweet and tart and stores very well. September 15. The ultimate salad apple, it stays white in a salad longer than any other. It's great for eating, pies and sauces also. September 15. 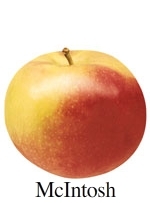 Exceptionally crisp and juicy, with a sub-acid flavor, Honeycrisp is becoming a fan favorite. A fairly difficult apple to grow, it is well worth the effort. 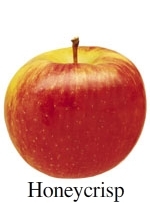 A good pie apple, but it is best known for eating. September 15. 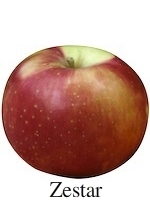 A honey sweet apple with a crisp, golden flesh; its rich mellow flavor is an asset to any recipe. October 1. 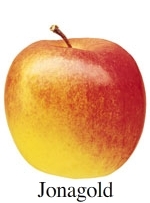 A classic apple in America; mildly sweet with a crisp yellow flesh; excellent for eating and salads. October 1. It's name reflects it's parentage of Jonathan and Golden Delicious. It combines tart sweetness and crispness in texture. October 5. An apple with firm, white flesh, this is a mildly acidic apple. This apple excels as a baking apple. October 5. 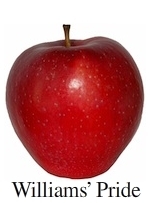 A great snacking apple, Fuji is very juicy and sweet with a distinct crispness. Fuji applesauce needs little or no sugar. 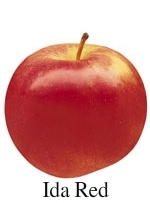 Williams’ Pride: An early maturing, dark red apple with excellent fruit quality and field immunity to diseases, (this variety requires less spraying). It is spicy and great for either baking or eating. August 15. Zestar: An early ripening apple with a delightful balance of flavors; it is semi-sweet, crisp, juicy and makes a fantastic eating apple. August. 20. Gala: Its thin skin and smaller size make it a perfect lunchbox apple. It has a mild, sweet flavor with a creamy yellow flesh. September 8. McIntosh: This versatile apple is great for eating, pies, sauces, and salads. It's juicy, somewhat tart, and has an aromatic scent that lets you know fall is here. September 15. Jonathan: This is a great keeping apple with a spice all its own. It has a crisp, juicy, flesh and is good for eating, but a perfect pie apple. Empire: I think Empire is the best apple on the market. A perfect apple for baking or eating. It is a cross between a Delicious and McIntosh, and is a blend of sweet and tart and stores very well. September 15. Cortland: The ultimate salad apple, it stays white in a salad longer than any other. It's great for eating, pies and sauces also. September 15. 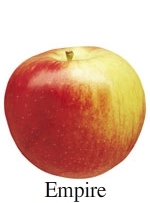 Honeycrisp: Exceptionally crisp and juicy, with a sub-acid flavor, Honeycrisp is becoming a fan favorite. A fairly difficult apple to grow, it is well worth the effort. 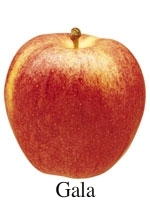 A good pie apple, but it is best known for eating. September 15. 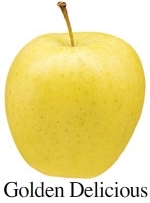 Golden Delicious: A honey sweet apple with a crisp, golden flesh; its rich mellow flavor is an asset to any recipe. October 1. 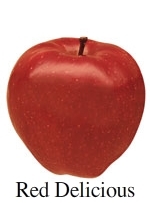 Red Delicious: A classic apple in America; mildly sweet with a crisp yellow flesh; excellent for eating and salads. October 1. Jonagold: It's name reflects it's parentage of Jonathon and Golden Delicious. It combines tart sweetness and crispness in texture. October 5. 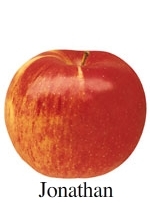 Ida Red: An apple with firm, white flesh, this is a mildly acidic apple. This apple excels as a baking apple. October 5. 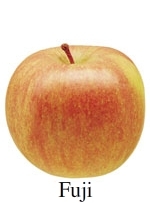 Fuji: A great snacking apple, Fuji is very juicy and sweet with a distinct crispness. Fuji applesauce needs little or no sugar. Apple pictures are courtesy of Michigan Apple Committee. Zestar courtesy of University of Minnesota. Williams’ Pride courtesy of Eastman’s Antique Apples.